A judge set bail Friday at $1.5 million for each of the three Santa Clara County correctional deputies charged with murdering an inmate who was found beaten and naked in his jail cell last month. Deputies Matthew Farris, Jereh Lubrin and Rafael Rodriguez are accused of going into the jail cell of Michael Tyree and beating him to death, prosecutors say. They're also charged with assaulting another inmate. The deputies looked grim as Judge Allison M. Danner announced decision. Bill Rapoport, attorney for Farris, told the judge the deputy isn’t much of a flight risk, because he still lives in the house he grew up in, with his parents and fiancée. “He’s not going anywhere,” Rapoport said. "My client is definitely tied to the community." Lubrin, 28, Farris and Rodriguez, both 27, have been in custody since their arrest on Sept. 3 following the Aug. 27 in-custody death of Tyree, a schizophrenic homeless man who had finished his 5-day petty theft sentence and was waiting to be transferred to a treatment center for mental illness. Defense attorneys had called for bail to be set between $100,000 and$200,000. Evidence has shown the defendants were "quite violent" when they were unsupervised and "tormented" inmates before Tyree's death, Deputy District Attorney Michael Braker said. The guards, who face a life sentence if convicted, have first-hand experience of life inside jail and that may lead them to flee the area, Braker said. They may also "intimidate" witnesses in the case through other jail guards or inmates, according to Braker. The guards, who are currently on paid administrative leave, entered the sixth floor wing of the jail around 10:45 p.m. on Aug. 26 when they allegedly beat Villa over a dispute with another inmate, prosecutors said. Minutes later, Lubrin and Farris allegedly entered Tyree's cell and assaulted him while Rodriguez stood by the door, according to prosecutors. 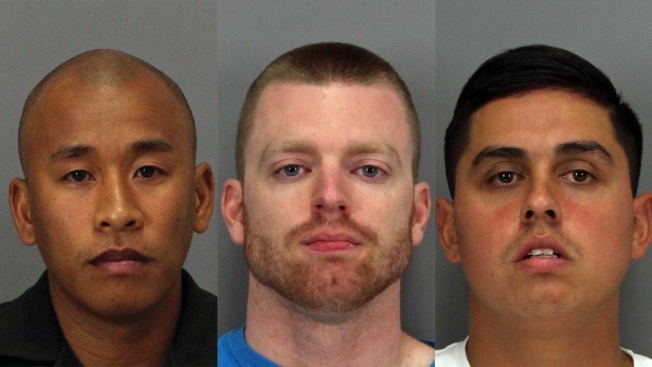 A judge set bail Friday at $1.5 million for each of the three Santa Clara County correctional deputies charged with murdering an inmate in their custody who was found beaten and naked in his jail cell last month. Stephanie Chuang reports. Tyree, 31, who suffered from mental illness, was pronounced dead roughly two hours later around 12:30 a.m. on Aug. 27. Another text allegedly sent from Farris to Rodriguez said: "I love 6A (cellblock) no camera and no groups, I hope I keep it." Rapoport said the texts are taken out of context. "I can tell you: in a jail setting and in the emergency medical setting, people say a lot of things,” he said. “It’s called gallows humor." None of the three correctional officers have entered a plea to any of the charges. Another bail hearing is set for Sept. 28 before a possible plea hearing scheduled for Oct. 13. New court documents reveal some troubling details about the Santa Clara County Jail guards accused of murdering an inmate. Damian Trujillo reports. NBC Bay Area's Robert Handa and Bay City News contributed to this report.